Photo: Jones (right) and Dr. Hendee (second right) during meeting with local stakeholders. Basseterre, St. Kitts – Officials in St. Kitts and Nevis will have a better idea of how climate change is impacting coastal areas and marine life within the federation’s nearshore waters, thanks to the USAID-Climate Change Adaptation Programme (CCAP). The CCAP will allow for the placement of two coral reef monitoring buoys called Coral Reef Early Warning System (CREWS) stations. These stations contain sensors to monitor meteorological and air-based data such as wind speed, barometric pressure and UV rays, as well as oceanographic sensors that measure salinity, sea temperature and more. Coral reefs are vital, as they contain the most diverse ecosystems on the planet. They also protect coastlines from the destructive force of wave action and tropical cyclones, as well as provide shelter for many marine organisms. Albert Jones, instrumentation officer at the Caribbean Community Climate Change Centre in Belize, and Dr. James Hendee, director of the Ocean Chemistry and Ecosystem Division at the National Oceanic and Atmospheric Administration/Atlantic Oceanographic and Meteorological Laboratory, are in St. Kitts and Nevis to spearhead the programme’s implementation. “We are trying to get a baseline of the exact status of your coral reef systems right now; having that baseline, you will have some sort of platform to move forward,” said Jones, adding that this will be a vital step in identifying and sustaining marine protected areas to restrict human activity in order to protect natural resources. CREWS stations have already been established in waters around Puerto Rico, St. Croix, Jamaica, Bahamas, Barbados, Belize, Grand Cayman, Florida, the Dominican Republic and Tobago. Hendee said that this phase focuses on Antigua and Barbuda, St. Vincent and the Grenadines, Grenada, Saint Lucia and St. Kitts and Nevis. 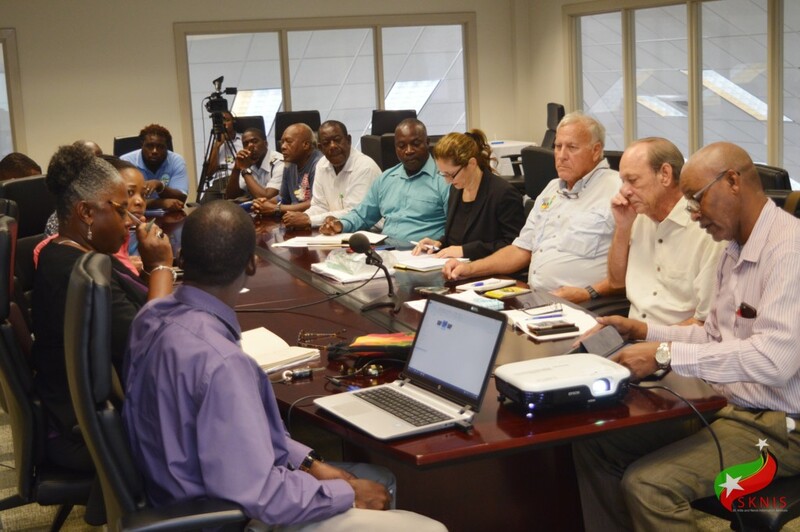 Local stakeholders from the departments of Agriculture, Marine Resources, and Environment, as well as the Coast Guard Unit, were briefed about the CCAP and its mission at a meeting held at the conference room of the Ministry of Finance Oct. 17. The visiting team will work with the officials to tour potential sites where the CREWS stations can be placed to gather data on the health of the coral reef environs in St. Kitts and Nevis. Hendee said the buoys will be installed next year and the data that they transmit will be collected in Miami, Fla. This data will be made available online and accompanied by an ecological forecast. The information in the forecast will assist policy makers in developing national strategies and also inform regional responses to problems such as coral bleaching, which can precipitate the death of corals.